(Nanowerk News) Researchers from the Paul Scherrer Institute PSI in Villigen and the ETH Zurich have discovered a special phenomenon in magnets (Science, "Chirally coupled nanomagnets"). This phenomenon takes place at the nanoscale and enables magnets to be assembled in unusual configurations, which could also be useful for computer technology and data storage. Magnets are characterized by the fact that they have a North pole and a South pole. If two common magnets are held close to each other, opposite poles attract and the like poles repel each other. This is why magnetic needles, such as those found in a compass, align themselves in the Earth's magnetic field so that we can use them to determine the cardinal directions North and South and, derived from this, East and West. In the world that we experience every day with our senses, this rule is correct. If you leave the macroscopic world and dive into depths of much smaller dimensions, this changes. Researchers at the Paul Scherrer Institute PSI and the ETH Zurich have now discovered a very special magnetic interaction at the level of nanoscopic structures made of magnetic layers only a few atoms thick. The atoms act like tiny compass needles and unfold their effect over tiny distances in the nanometer range, for instance a few millionths of a millimeter. That is why researchers also talk about nanomagnets. The phenomenon that researchers at PSI have now been able to observe is based on an interaction that the two physicists Igor Dzyaloshinskii and Toru Mariya predicted more than 60 years ago. "That was our starting point," says Zhaochu Luo, physicist at PSI and ETH Zurich. In this interaction, the atomic compass needles do not only align in a North-South direction, but also in an East-West direction. "Where they point depends on how the atoms in their neighbourhood orient themselves," says Zhaochu Luo, first author of the study. For example, if a group of atoms points North, the neighbouring group always points West. If one group of atoms points to the South, then the neighbouring atoms orient themselves to the East. These orientations can be reversed by magnetic fields or electric currents, i.e. North to South and vice versa. The neighbouring atomic groups then reorient themselves accordingly, either from West to East or vice versa. 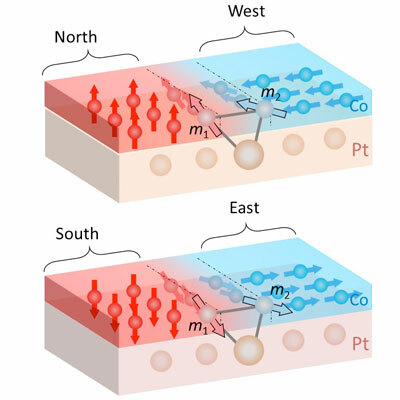 The researchers discovered the coupling of North-West and South-East orientation with the help of a layer of cobalt atoms only 1.6 nanometres thick, which was sandwiched between a platinum layer on one side and an aluminium oxide layer on the other. "The development of these special layers for our experiments alone took about half a year," says Zhaochu Luo, who works in Laura Heyderman's Mesoscopic Systems research group at PSI. What is unusual is that this interaction takes place laterally in one plane. Previously, comparable couplings between nanomagnets could only be detected vertically, with groups of atoms arranged one above the other. The phenomenon observed jointly by PSI and ETH Zurich researchers enables the development of planar magnetic networks. Among other things, synthetic antiferromagnets can be produced. In these antiferromagnets, atomic groups point either North or South at regular intervals. The number of opposing nanomagnets is approximately the same, so that they neutralize each other in sum. This is why, at first glance, antiferromagnets do not act like magnets – for example, they do not stick to a fridge door. The neighbouring atoms, which are oriented either to the West or to the East, act as spacers separating the magnets pointing North or South, each of which is as small as a few nanometers. This makes it possible, for example, to build new, more efficient computer memories and switches, which in turn makes microprocessors more powerful. The individual nanomagnets, which face either North or South, are suitable for constructing logic gates. A logic gate is a building block in a computer and functions as a kind of switch. Signals enter these gates and are then processed into an output signal. In a computer many of these gates are networked to perform operations. Such a gate can also be constructed with the help of nanomagnets aligned to the North or South. These are analogous to processors commonly used today with transistors processing signals in binary form, which interpret all signals as zero or one. Nanomagnets that are oriented either North or South can also do this. This could make microprocessors more compact and efficient. According to Prof. Pietro Gambardella, who supervised this study with Prof. Laura Heyderman, "This work provides a platform to design arrays of linked nanomagnets and achieve all-electric control of planar logic gates and storage devices'.". In addition to laboratory based methods, the researchers achieved their results by means of X-ray photoelectron microscopy at the PSI's Swiss Light Source SLS.